It's that time of year for my annual Funky Tofurkey Tour where I head up yonder to Kentucky and DJ a trio of cool gigs sure to make you shake off the stuffing. This trip is always fun. I don't have family in Kentucky or anything ... I've just acquired some cool friends who think it's a nice tradition to bring me up for Thanksgiving every year. This is the fourth time, i think. Escape that awkward family gathering by joining NateFX and myself for a good bit of drinks & beats. 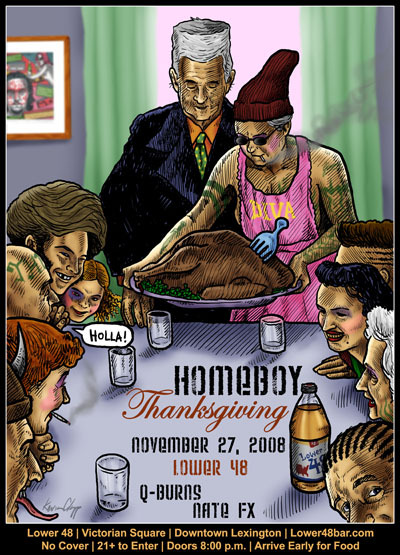 This is the Homeboy Thanksgiving we do every year, and this time it's at Lower 48 located at 401 W Main Street in Lexington. There's no cover ... here's the venue's MySpace page: www.myspace.com/lower48bar ... the flyer is below. Off we go to Louisville and one of my favorite venues Pink Door. My last gig here was fantastic ... I had such a great time. The night is called Come Get Funked! 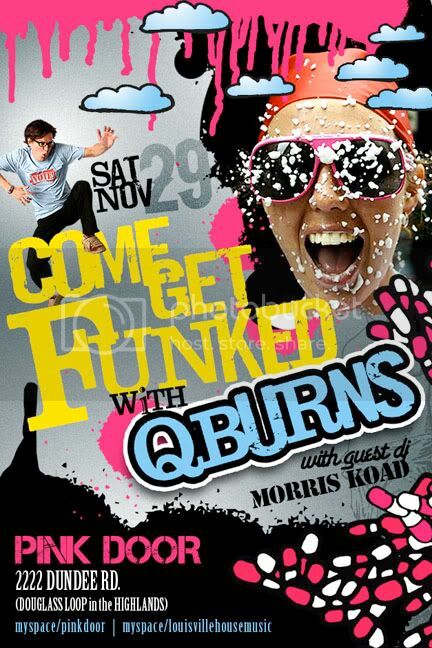 and I'll be joined by Morris Koad for what promises to be a top notch night of quality funk-filled tunes. This takes place at Pink Door, located at 2222 Dundee Road in Louisville. There's no cover before 11 PM, and it's $5 afterwards. Here's the Pink Door web site: www.pinkdoorlouisville.com ... flyer is below. If you find yourself in Kentucky then I hope to see you at one or more of the gigs!